Jody Ewing at her home in Onawa on Thursday, June 25, 2015. Ewing is the founder of Iowa Cold Cases, a website dedicated to cold cases around the state. Originally started as part of a reporting project, Ewing found herself in shock when she had to put her own father, pictured in the portrait above her, on the website after he was killed in an explosion. She was writing book reviews for a Sioux City newspaper, which even 10 years ago wasn’t considered eye-grabbing material for the masses. An editor asked her to take on a series of cold cases — unsolved murders — the kind you see on TV shows. People love that stuff. With three unfinished novels in a drawer, Jody Ewing could hardly turn down an assignment. And when she heard about Donna Sue Davis, there was no going back to writing about books. The 21-month-old toddler with clear blue eyes and curly blond hair was snatched from a crib in her home in a working-class Sioux City neighborhood and later raped, sodomized, beaten and killed from a severe blow to the head. Her killer was never found. “I couldn’t believe in 1955 that someone could commit such a heinous crime and not be caught,” Ewing said. Ewing ached for Donna Sue and the other victims. Thoughts of their still-free murderers kept her up at night. The Onawa woman launched Iowa Cold Cases, with its website iowacoldcases.org, to document each case, so those victims would be remembered, and their assailants would be kept sweating. People flooded her website, asking if she could feature their fallen family member. She eventually worked on it full time as it grew to 540 cases. Iowa newspapers across the state have launched a project dedicated to telling the stories of Iowa’s unsolved homicides. Ewing, 56, still haunted by justice not yet served, is a reliable guide through these mysteries. In addition to writing on her website, Ewing has been a constant voice in the ear of Iowa law enforcement officials and acts as a buffer between them and family members who are often frustrated with their efforts. To them, Ewing is the person who will still listen, the one who hasn’t given up hope. “If you could hear the voices of these family members ….” Ewing said. She taps away at her computer through the night. 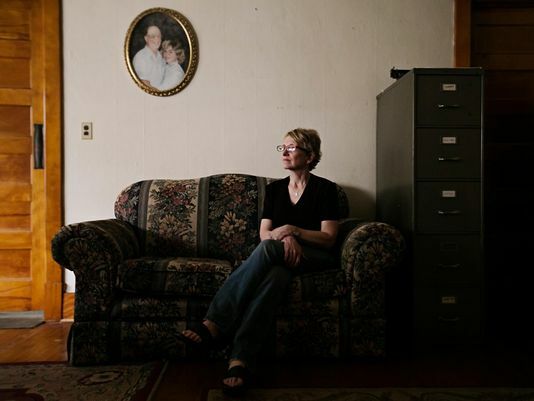 She didn’t sleep at all before a recent interview in her Sioux City home, whose front room is equipped with a large desk bulging with deep case files. She works for no pay, often 16 hours a day. She and her husband, Dennis, live sparsely on his disability check after his stroke a year ago. Her nonprofit receives no grants, and she says she gathers an average of only $500 a year in donations. She even sold her truck. Ewing says the cases are like a puzzle you can’t quit working on. One can hardly ask her about her own life; she diverts the conversation to one unsolved case after another. 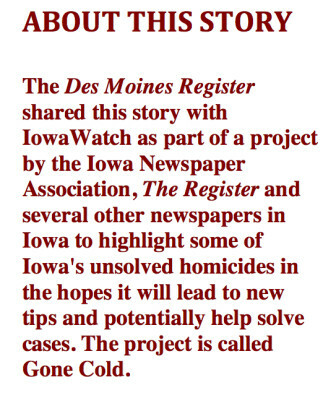 LISTEN TO THIS PODCAST WITH IOWA NEWSPAPER ASSOCIATION EXECUTIVE DIRECTOR CHRIS MUDGE AND IOWAWATCH’S LYLE MULLER TO LEARN ABOUT THE GONE COLD PROJECT THAT THE ASSOCIATION AND SELECT IOWA NEWSPAPERS LAUNCHED ON JULY 26, 2015. Family members have subtly suggested she take a paying job and, not so subtly, slipped her employment want ads. It’s not just empathy that keeps Ewing going, but a quiet outrage in the pursuit of unrealized justice. She talked to Veronica Lack of Waukee on the telephone for hours the other night. She is the mother of Adam Lack, a death chronicled extensively on her website. Veronica Lack said her family was involved in a longtime dispute with Mitchell County landowners over water runoff that she claimed fouled the environment and harmed their farm in the county. It got ugly, she told the Register, and the family was bullied. Adam Lack, 33, a Brown University graduate with expertise in environmental issues, had enough one night in July 2008, and went out to investigate an intruder on the family land, his mother said. He rolled his pickup negotiating a curve, was pinned in the vehicle and found dead several hours later. Veronica Lack shared photographs of the scene with Ewing and information to suggest that his death was no accident. Mitchell County Sheriff Greg Beaver said Lack’s case was ruled a motor vehicle accident because there was no indication it pointed to foul play. Authorities are not investigating it further. The website sometimes skirts on the thin lines of insinuation, naming people with links to the victim or the crime scene who have never been charged or officially listed as a suspect. That said, Motsinger follows up on tips from Ewing. Family members will remember or tell her things police haven’t heard before. “I can’t say it’s led to an arrest or anything, but it’s good information,” he said. 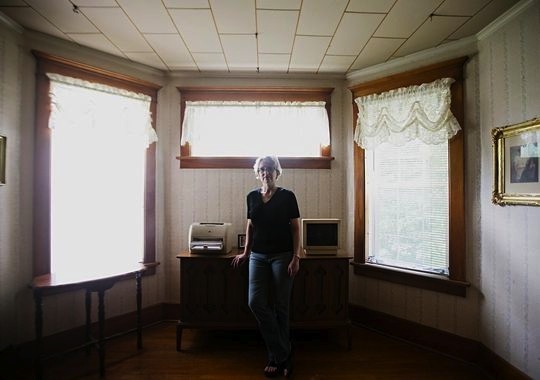 Jody Ewing at her home in Onawa on Thursday, June 25, 2015. Ewing says she has a knack for extracting information from people — mainly with kindness and a listening ear — and family members will get investigative files from authorities and fax them to her. That’s how she got the autopsy report of Kim Loose, who reportedly fell out the door of a moving car in 1998 in Scott County. Authorities there say the death was ruled an accident, and it has never been investigated as a homicide. But Ewing studied the information and a photograph of the accident scene sent by the family. She came to the conclusion the injuries to Loose’s body and what killed her were inconsistent with that story. One of the three young men at the scene of the accident disappeared the next day and was later found dead in the river after leaping off a bridge. But Ewing took some of the information off her website because she was concerned about future suspects using it to change their statements to authorities. In another case, Ewing is so convinced a killer is living in a northeast Iowa community that she put his name on hidden metadata, so when people search for his name online, her Iowa Cold Cases website comes up. She said she didn’t worry because the woman was too ignorant to realize that if what she writes on her web site is wrong, it would be libel. HOW TO HELP: Information and tips may be sent to this Iowa Cold Cases link. Ewing couldn’t fathom the twist of fate when her own stepfather ended up on her website. Earl Thelander died after copper thieves stripped the gas lines from a home he was preparing for renters in Onawa and a fire broke out when he plugged in a fan. Ewing can’t stop, just knowing the killers are out there. She’s become friends with the mother of Jaymie Grahlman, who died in a fire while being watched by her father and girlfriend in Cedar Rapids in 2003. A neighbor with a low IQ was charged and acquitted, but Ewing said he was a convenient “patsy” for the person she suspects after looking at autopsy photos and seeing mysterious burns on the girl’s chest inconsistent with a fire. She doesn’t take credit for solving crimes but feels like she has played a part. For example, Holly Rae Durban’s case in Shenandoah went cold before Ewing talked to Durban’s sister, who said it was Holly’s boyfriend who killed her in 2009. Ewing posted the story, and a couple of years later, Brian Davis was charged. Last February, he was convicted of first-degree murder. It doesn’t come without risks, perceived or otherwise. 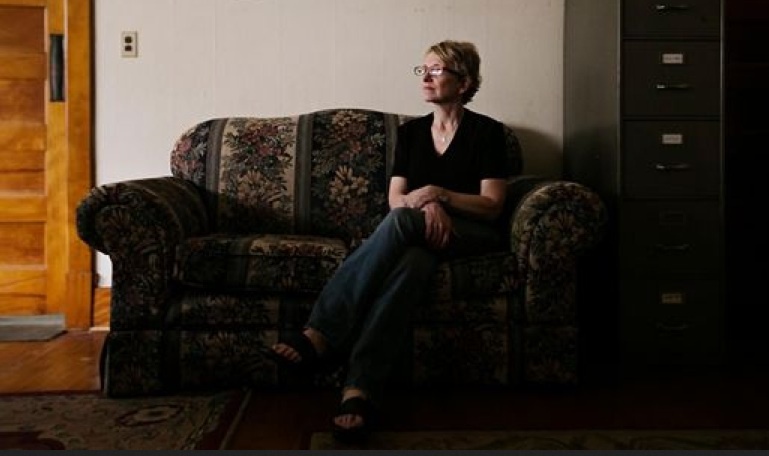 In the middle of one dark night, she answered the phone to hear this: “I didn’t kill Michelle.” Another time she heard a voice over the phone tell her about two men who got away with a murder, had changed their names, and are now successful residents in an Iowa town. She looked up the names and photographs and, sure enough, they were the same two men in images of leading suspects in her research. Ewing locks all her doors now. She is considering taking training on the proper firing of a gun. She uses a code name to protect one man who said he’s been threatened after he came to her with information that he witnessed a cold case murder. “I never used to be this paranoid,” Ewing said. Which brings her back to the case of little Donna Sue Davis. The mystery obsessed her. She begged a police captain to tell her who she thought might have done it. She studied the crime, drew maps of the neighborhood, interviewed everyone she could — and never wrote about the case. It was too important to her to share it yet. Years later, her research file on the case bulged to several inches thick. Through her research, Ewing is convinced she knew the killer, confirmed privately by law enforcement, and knew where he lived. She tried to come up with a reason to knock on his door but didn’t before the elderly man died a few years ago. In the photographs used for his home’s sale, what she saw in the entrance made her sick: A small table the size for a child and a box of crayons. So she went to the place that Donna Sue was last seen, sleeping in her crib. The family had long moved away. A woman answered the door and, after hearing the story, asked Ewing if she wanted to see the house. She entered the bedroom and stood motionless, almost in a trance, looking out over the neighborhood where a man she believes once shuffled away with a child but was never punished. Mike Kilen is a Des Moines Register reporter. Read more stories in the Gone Cold series, explore the database and watch videos on Iowa’s unsolved murders at DesMoinesRegister.com/GoneCold. For more on the Iowa Newspaper Association go to this link. This podcast of an IowaWatch Connection radio report lets you hear more about the abduction and murder of two Evansdale, Iowa, cousins, and efforts to find their killer or killers.